Question: I am about retire. Did not save much for my family. The thought that I do not have enough wealth to make my family feel secure has been weighing heavily upon my mind for a long time. I am a spiritual person, yet the feeling that I do not have enough wealth keeps nagging me. Is wealth evil? Is pursuing wealth sinful? Please help me. I do not know what circumstances led to your current situation. That, you have to analyze. I will try to address the last part of your statement, why we value wealth so much as if it is the only important thing in life, and whether wealth is evil or pursuing it is sinful. To answer them, you have to know why anyone wants to be wealthy and what people want to accomplish with wealth. Wealth is like any other material thing in life. You use wood or some fuel to cook food, water to quench your thirst or cleanse your body, and air to breathe. You never wonder whether they are necessary for you to live or whether they are sinful. You use them as you need them to survive and to pursue your other interests. So are many other things in life, a house, family, relationships, livelihood, name, children and knowledge. They are necessary for your survival and Wellbeing. So is the case with wealth. You need it for various purposes. You do not have to diminish or discount its importance. It is neither evil nor sinful in Hinduism to have wealth or earn wealth to meet your needs and discharge your duties to God and to others. 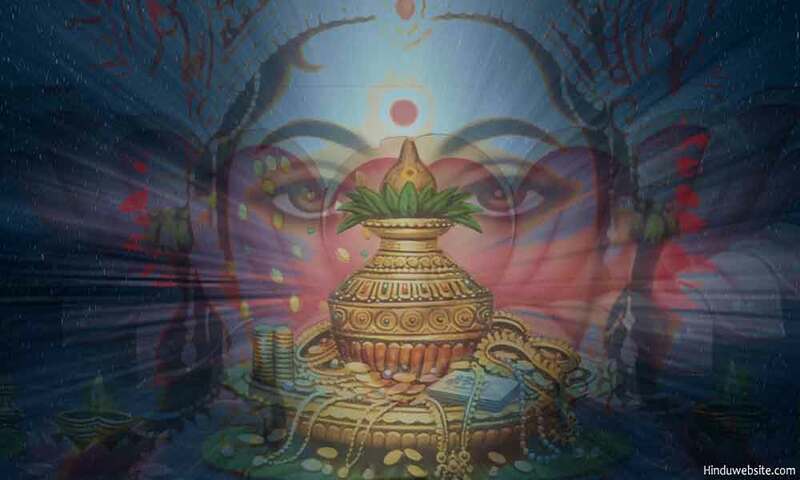 According to Hinduism, God is the source of all forms of wealth and abundance. His entire creation, including material wealth, is pure and divine. It is inseparable from him. Everything in it has a purpose and a role, just as every organ in your body has. They become evil or impure when they are put to wrong uses by evil people. People want wealth for multiple reasons. They may need it for security, comfort, enjoyment, pride and self-esteem, or they may need it to help others or serve them. It is uncertain how many people desire wealth for peace or selfless work. There must be few, but it does not mean wealth cannot be used for philanthropy or selfless service. Most believe that if they have wealth, they can not only enjoy wealth but also do philanthropic work without feeling insecure. Such an attitude betrays their fear and lack of faith in God and their weak commitment to Hindu Dharma. Your choices and values play an important role in determining what you want in life. They in turn depend upon your beliefs and conditioning. If you think wealth is the most important thing in life, believing that it is going to make you proud and happy, you will spend most of your life in the pursuit of wealth. It is a selfish approach which has its own consequences. With that attitude, you are bound to suffer whether you succeed in earning wealth or not because you stand alone in that battle, without God or Dharma on your side. As long as your intentions are good, your pursuit of wealth is perfectly justified in Hinduism. To pursue any aim in your life, your beliefs, values and choices must be in perfect alignment with each other and with your essential nature, without conflicts. Sometimes you may think wealth is important to your happiness but subconsciously you may be afraid of being wealthy and do everything possible to minimize your chances of earning wealth. This self-sabotaging behavior is why many people fail to earn wealth, although they may have a strong desire to do so. The Bhagavadgita clearly states that if you cook food solely for yourself, you verily eat sin. If you are suffering because you do not have enough wealth or you have not done enough to earn wealth, it may be because you wanted wealth for yourself and your family and never considered using it for a higher purpose. You might not have brought God or a spiritual purpose into the equation or considered that you had an obligation to use wealth for God's work and serve his aims upon earth as his true servant or trustee. Perhaps, you do not know or believe that all wealth belongs to God and you can only hold it in good faith to execute his will. Like most other people, you might have solely thought about yourself and your goals, expecting to enjoy life and secure your welfare and that of your family with your wealth, rather than using it for righteous purposes. Since you lacked faith and right intentions and since you thought as an individual rather than as part of God’s Dharma, you became the sole carrier of the burden and its weight upon your conscience. It is the same as the state of those who fought against the Pandavas in the Kurukshetra. They had the army (wealth) of Lord Krishna, but he and his Dharma were not on their side. It is true that the world treats you differently if you have more wealth. The world not only puts a lot of value upon wealth but also associates many good qualities and traits to those, who possess it in abundance. It is why wealthy people enjoy a certain aura in society, command greater attention and respect and hold powerful positions and offices. Even among spiritual people, it is the rich and powerful Swamis and Babas who wield considerable influence over common people and receive most of the attention, adulation, publicity, following, respect and donations. When you tie the worth of a person to his monetary value, you will not look at the person but his possessions. You also do the same to yourself and thereby torture yourself if you believe that you failed to measure up to your own expectations. Wealth is not the only way to look at yourself or others. There are many other options and alternatives. You can use a different value system to set your priorities and live your life, by breaking free from the shackles of conditioning, which the world imposes upon you, and choose to be a different person with a different value system. Frankly speaking, wealth is important and necessary to lead a comfortable life, enjoy small pleasures and feel blessed. You should do your best to earn wealth, and leave the result to God. If you fail to earn material wealth, know that it is God's will and he wants you to use other forms of wealth such as knowledge or intelligence to serve him. Lack of wealth is very serious limiting factor, but it is not the end of all. You still have many other options to be a warrior in the battlefield of life and do your duty. We have four castes in Hinduism for this very reason. For a Brahmana, knowledge is wealth, for a Kshatriya courage and valor, for a Vaisya material wealth and for a Sudra service and physical strength. With these four forms of wealth, people can perform their duties and achieve liberation. Even if you do not have wealth, treat it with respect and do not scorn it as evil or sinful. If anyone says that wealth is evil, you do not have to believe in it and thereby limit your own chances of success and happiness and opportunities to serve through self-destructive behavior. As a Hindu householder, you have the right as well as the obligation to earn wealth to meet your commitments and participate in God’s work upon earth. However, according to Hinduism it is evil to earn wealth through unjust and unfair means, by violating the divine laws. It is very difficult to earn wealth righteously, without hurting and harming others or depleting their wealth or happiness. It is also difficult to justify your pursuit of wealth, when you earn it solely for selfish ends. You understand the logic when you accept the basic premise that all the wealth in the universe belongs to God and none else, and whatever you draw from his abundance is a karmic debt which you are required to repay. Hinduism does not discount the importance of wealth. However, it does emphasize that it should not be the sole aim of human life. Therefore, for Hindu householders it prescribes four chief aims of human life (Purusharthas) rather than one. Of them, wealth (artha) is just one, the others being Dharma (virtuous conduct), Kama (physical pleasures and enjoyment), and Moksha (liberation). There is a moral in this. You cannot live by wealth alone, or make it the sole purpose of your life. There are other important values in life which you must choose and cultivate to serve and preserve the aims of creation. Whatever goals you may choose in life, they must be in alignment with the Hindu Dharma and must contribute to the order and regularity of the world rather than disrupting them. You can never be happy, however rich you are, if you put disproportionately a large value upon wealth with selfish intentions and ignore other important aspects of your life. Tying your peace and happiness to wealth alone, with selfish attitude, will potentially make you vulnerable to suffering, anger and envy. There is a reason why death ends all your ownership and relationships. It bears the truth that everything here belongs to God. Therefore, choose wisely, knowing how you can live a fuller life as a sacrifice or offering. Examine your intentions, beliefs and choices, and how they may effect your thinking and actions. If you remove selfishness from your thinking and pursue wealth for a larger purpose as an obligation or service, you will not suffer much even if you fail in your effort. You will consider it God’s will. You may feel unhappy for not being able to serve him as effectively as you wanted to, but you will move on with equanimity, doing your best within in the limitations to which you are subject. You will also find other alternatives to fulfill your aims of Dharma. For example, if you are not wealthy, you can still help others with knowledge or voluntary service. You can teach your children how to think for themselves, learn from your mistakes, and fight their battles with greater confidence and conviction. You can pass on to them either material wealth or the wealth of knowledge, character and wisdom to be better human beings. On the other hand, if you earn the wealth solely for your selfish ends, ignoring its ultimate purpose, you will not only suffer from bad karma but also pass on part of that bad karma to your children and suffer from double retribution. Hinduism sets a noble model for the householders to lead a holistic life, providing them with enough opportunities to enjoy their lives and serve the aims of God. Its message is simple. Be a complete person as God himself. The cart of your life should run on four wheels (aims), rather than one. Balance and moderation should be the guiding principles. Just as you use fire to warm your body or cook your food, but do not burn yourself by going too close to it, you should use wealth as the means to serve your noble aims rather than an end in itself. According to Hinduism, you may pursue wealth, but always for righteous ends, without greed, to meet your needs and as part of your obligation to serve God and to others. However, you shall not think that it is the only end that matters for your self-worth, pride or esteem. With the Dharma as your foundation, and with liberation (Moksha) as your ultimate aim, you can earn wealth (artha) and enjoy life (kama), knowing that in the end you have to transcend your selfishness and give up everything.